JordanCon is quickly approaching, and our eagerness is beginning to show! This week's interview is with Tim Lewis. He tells us about "Switch," his addition to the JordanCon Anthology. First, can you tell us about your writing? Is this your first published work? This will be my first published work! I’ve been writing for decades, but only for myself as one of many hobbies. Richard Fife’s idea to create short stories for the anthology inspired me to finally stop procrastinating. The publishing process is very daunting and this was a tremendous opportunity to break into the writing world. As to my writing, is “chaotic sugar induced child at a puppy farm” a style? I have piles of notes about writing best practices from the Writer’s Track at JordanCon, and I tried to incorporate each to some level as I work to find my niche. In the beginning it was random pieces as ideas came to mind, then slowly stitching them together, reluctantly killing a few “little darlings,” and then finally obsessing about each word and phrase until I had to walk away. Where does your story fall on the speculative fiction scale? After Googling “speculative fiction scale,” this is a soft science fiction story based on a near future to add some plot devices to move the story along, but it could be placed in any era. I started down a fantasy route but as the pieces begin to evolve then sci-fi seemed to be the best world for the story. What excited you the most with writing this story? My wife reads in bed and I can gauge how good a book is when she has an emotional outburst (and wakes me up). Whether it is a laugh, a cry, a gasp, or swearing like an East Indian sailor, I can see how much joy she gets from reading. When writing “Switch,” I tried to create each of those elements, and if I’m lucky, I may have succeeded with one. Are there any themes you want readers to get a sense of? I tried to paint a normal person that people could relate to that, of course, is put into extraordinary circumstances. I have always been a fan of the reluctant hero that rises to challenge rather than racing to it head on. I also added a few references to our current political and social climate that some may find entertaining, or even frustrating. Mostly I just wanted to be able to tell a story of a person that people could identify with as themselves, or someone they know, to create that emotional connection. Is there a specific inspirational source you used for this story? I drew inspiration initially from Do Androids Dream of Electric Sheep to create a future with minor changes in technology, but grounded in something relatable to the reader. That is why the story takes place in my home city of Huntsville, AL, so I had some specific ground to build on. I walked down the streets and by the buildings of the exact places that are talked about in the story to inspire the writing; at one point running like an idiot around the courthouse to see if my character could actually do what I described. For the science, a YouTube video about acoustic physics and the floating drop of water became the impetus for the technology. The story also evolved into a pseudo detective noir theme, not by intention, but just organically possibly from my obsession with watching movies. The biggest inspiration and the drive of the secondary narrative was a personal view of society and unconscious bias that I wanted to portray, but I will leave it there so as not to reveal spoilers. And a huge nod to the professional editors Robyn Huss and Chris Kennedy, who were critical in pulling me off the puppy farm to get everything together into a cogent story! What else would you like to say to your readers? Simply, thank you. I hope this gives you a moment to disconnect from the world and find some enjoyment; and if I was able to get you to wake your partner up while reading my story in bed, then my work was done! If you would like to see more, check out my site at www.LewisVenture.com. According to a Twitter poll from Amazon Prime Video, The Wheel of Time television adaptation is the most anticipated series. (IMAGE TEXT: We have a lot of shows that started as books, but which UPCOMING book adaptation series are you most excited for? #WorldBookDay; 20% Good Omens, 26% The Expanse, 18% The Lord of the Rings, 36% The Wheel of Time) While fans of the show rejoice, and agree, it's pretty amazing that Wheel of Time could top some of the other anticipated series. Bleeding Cool states how they "were NOT expecting Wheel of Time to top that list." Understandable, considering The Lord of the Rings has been hyped up. As has Good Omens, which already has trailers, cast, and an official release date (May 31, 2019--for those who were wondering). With Wheel of Time barely in production, this is a great indicator of how much we've wanted a show to represent our beloved series! You can catch the latest updates from Rafe Judkins' Twitter feed, which he updates pretty regularly with interesting hints and tidbits. Also, stay tuned to Dragonmount for more news. 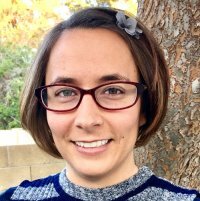 For our next entry in the first ever JordanCon Anthology—So You Want Stories?—I got to talk to Alexandra Hill about her submission "The Bakery: Prelude to a Fairy Tale." First, can you tell us about your writing? Is this your first published work? I read really broadly, and I think that translates into what I write; I’ve either finished or am in the process of stories in a number of genres, including sci-fi, mystery, fantasy, memoir, and so-called “literary fiction.” Fantasy feels like home, though, especially in atemporal or modern settings. I love how the genre lets me ask “what if…?” not just of my characters, but of the world in which they live. I’ve published academic writing under my real name – I’m a computational biologist by training, and have a few papers out under my real name – but “The Bakery” is my first work of published fiction. Where does your story fall on the speculative fiction scale? I think the title gives it away! “The Bakery: Prelude to a Fairy Tale” is fantasy, and sets up the world before “Once upon a time.” What excited you the most with writing this story? A million years ago, my Grade 12 English class was able to pick whatever topic they wanted for their final project. My subject: “Freudian Psychoanalysis and the Evolution of the Modern Day Villain.” I had a blast. I interpreted how Freud would have interpreted the backstories of villains in three 90s Batman Movies and three novels (Perfume, Harry Potter, and Hannibal Rising). Writing this story felt as fun as that project. I loved creating my own spin on the backstory of a female villain. I think the world sees a lot of stories of men behaving badly, and having some kind of origin story for their evil and/or redemption arcs, but historically, women’s stories haven’t been explored that way. I don’t think that Elle’s life justifies any of her more “established” story, but I hope I’ve managed to create more depth to the character! Are there any themes you want readers to get a sense of? I’ve always been fascinated in peoples’ opinions of themselves. I think most people think that they’re fairly good people, but situations like Elle’s, where you’re stuck between impossible options through no fault of your own, mean that most people’s moral sense gets thrown out the window. I hope that readers ask themselves what they’d do in her place – and then really ask themselves what they’d do if they were her. Is there a specific inspirational source you used for this story? Yes. …What, you think I’m going to give away the ending? What else would you like to say to your readers? I hope you enjoy this story! If you see me at JordanCon, be sure to stop and tell me who your favorite fictional villains are. Thanks, Alexandra, for joining us at Dragonmount! And don't forget today is the last day to preorder So You Want Stories? from JordanCon's website. The convention will have a few copies on hand, but don't risk it! With JordanCon fast approaching, I want to take this opportunity to give a preview of what the 2019 anthology, So You Want Stories, will entail. First some background information. This is the first year JordanCon put out a call to past and present members, seeking submissions of speculative fiction short stories to feature in an anthology—with proceeds going to JordanCon Charities, which get donated to the Mayo Clinic. Twenty of the submitted stories were chosen, and some are written by authors we know and love, including Brandon Sanderson and Jason Denzel! Some, however, are relatively unknown. Leading up to JordanCon, I will feature one of the lesser known authors each week. This week’s author is Andy Floyd, with his contribution “Doorbuster.” First, can you tell us about your writing? Is this your first published work? It is my first published work! But it’s definitely not the first thing I’ve written. The very first thing I ever wrote was Deep Space Nine fanfiction. I was in high school and it was just before the internet became a huge thing, so I had no idea what fanfiction was. I just thought I could write a Star Trek novel and submit it to someone to be published! After that, I mostly dabbled in song parodies and web comics until I graduated college. Then, a friend of mine (who also happens to be the one who introduced me to DragonCon and cons in general) told me I should join him for NaNoWriMo. I felt overwhelmed, but I had a blast and actually made my goal word count! All I wanted to do after that was write. Though, thankfully everything from that era is lost to a hard drive crash as it was all very, very terrible. (Seriously! I fridged not one, but TWO characters in my first novel. It’s all better off lost to the ether.) But, I kept it up until about ten years ago when for a number of reasons I just stopped. I continued having ideas, but with a very few and minor exceptions, I didn’t write them down. Then, a couple of years ago I got an idea for a novel about magic tech support. So, with motivation I hadn’t felt in nearly a decade, I sped to around nine thousand words... and then I got stuck. Fast forward to JordanCon 2018. It was my wife’s and my first JordanCon and we were blown away! Not only that, but the whole thing inspired me to write again! I picked back up that novel and tried to get back into it. But, no matter what I did, I just couldn’t connect with my characters. Then, the anthology contest was announced. I decided I had to submit something, anything to it. After a lot of thought I finally decided on a prequel to my novel. I thought it’d make a great short story, but could maybe also help me connect with my characters. It worked like a charm! As soon as I finished it, I launched into the novel and completed it as well. So, not only is “Doorbuster” my first published work, but it’s also the first story I finished after a very long writing hiatus which makes it very special to me. I’m extremely excited to see it in print! Where does your story fall on the speculative fiction scale? I mean, it’s probably just Contemporary Fantasy, but I like to say it’s “Suburban Fantasy.” This started off as a joke to me, because it has a lot of Urban Fantasy elements, but the whole story takes place in a big box store at a shopping center during broad daylight. But, I really liked the idea, so I googled it. I was sure someone else had used it before, but the only reference I could find with my very quick searching was, “Untitled Pixar Suburban Fantasy Movie.” I figure, if it’s good enough for Pixar, it’s good enough for me. So I’ve stuck with it and that’s what I use in my queries. What excited you the most with writing this story? That it got me back into the writing habit! But, really -- and actually I should clarify first -- even though my JordanCon Anthology short story “Doorbuster” stands on its own, it’s hard for me to separate it from my novel. I wrote them at the same time and one leads right into the other. So, some of the things that really excited me about writing it don’t really pay off until the novel. I’m sorry if that’s cheating, but it’s true. And those “things” were getting to explore how I felt about my day job and where I wanted to be five, ten years down the road. “Doorbuster” is about how the main character Taryn first gets into magic support, which mirrors my own story with tech support. Then, the novel jumps to five years later and we really get into her (and my) thoughts and feelings on being stuck in a job while also self sabotaging herself into not moving on to anything else. Getting all of that out onto the page really helped me not only do what I love by writing more, but it also helped me start the process of finding a different and better day job myself. Are there any themes you want readers to get a sense of? I’m not their English teacher! They have to do their own homework! Kidding, but not really? It’s not that there aren’t themes. There are. I mean, that keeps things interesting, right? But I enjoy genre fiction for its escapism, so that’s really the main thing I want people to get from my writing. If they get anything else out of it, that’s a huge bonus, but not necessarily the first thing I’m thinking of when crafting a story. Is there a specific inspirational source you used for this story? You mean apart from JordanCon? Well, my day job is tech support and I keep a Google Doc open the entire time I’m working. I’m constantly adding either transcripts or cliffs notes of calls I get. Every single “magic support call” in “Doorbuster” and my unpublished novel comes from that file. Apart from that, the characters are mostly based on friends. I tend to give them the positive traits I love from my friends and then add my own flaws and insecurities on top. What else would you like to say to your readers? First off, I really hope that if you can get a copy of the JordanCon Anthology You Want Stories? that you enjoy Doorbuster. Though, if you can’t get your hands on it, don’t worry. Once the publishing rights revert to me, I’ll put it up on my website. Until then, you can follow me on the tweeter (@pandrewfloyd) and check my site for other content. It’s still under construction, but I’ve got a few things up like the first chapter of Factory Defect (the aforementioned novel sequel to “Doorbuster”) and a deleted scene or two. Second, keep an eye out for me. I’ve gotten a taste of what it’s like to see my words in a printed book, and I’m not going to stop until it happens again and again. Thanks, Andy, for joining us at Dragonmount today! If you would like to get a copy of So You Want Stories? preorders are available until April 8th. Check out JordanCon’s website for more information. Our friends at Ta'veren Tees celebrated their eighth birthday earlier this week! 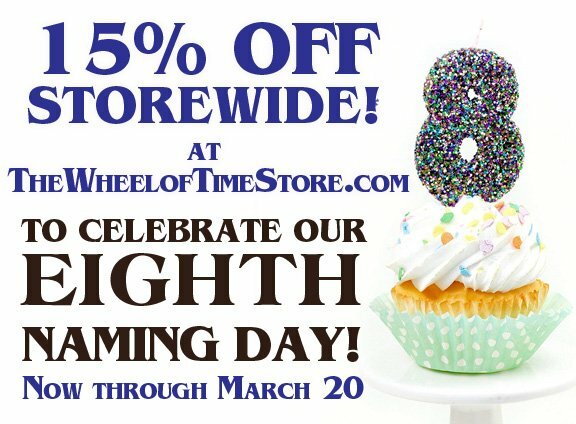 That's an amazing eight years of fantastic officially licensed Wheel of Time goodies. They also have some new merchandise to show off! The nameday sale goes on till March 20th, so act fast! We are looking into this! We’ll keep you posted! Welcome back to another exciting edition of "Meme Monday." Today we'll look at some of the woes that plague the Dragon Reborn in his relationships. We covered one of the major negative impacts on Rand's girl troubles a few weeks ago. But let's add another log to that fire. And still on the subject of his love interests, Rand has an awful lot to deal with to keep his sigfigs happy. And let's not overlook Rand's not-romantic relationships. He is a ruler, you know. A king. A chief. He makes a lot of important decisions. The memes this week come from Kevin O'Bryan of DMEN Designs. If you have memes you want to share, email me at frontpage@dragonmount.com. 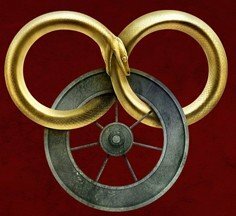 I wanted to take a break from our normal memes to talk about a new reader who’s taking the Wheel of Time fandom by storm. Christopher Green started reading The Wheel of Time in January. His father is a huge fan, and Christopher started reading after his father suggested it to him. Around the middle of his read of The Eye of the World, Christopher began to post real time updates about his progress and his reactions on the Facebook public group Screw You All, I Love Wheel of Time. The journey has been amazing so far, and many fans are reliving the joys of a first read through Randland. Some of Christopher’s first posts into The Great Hunt: (Alright..... how in the WORLD..... am I gonna sit down all relaxed to read this book before my wife made super sweet awesome dinner of chili.... to find in the first two chapters before dinner...... The dark one is alive and apparently regaining his physical form with like 100 darkfriends AND this [amyrlin] person the queen of the aes sedai shows up the end of chapter there isn't any messing around I hope that [amyrlin] lady helps him) (This is me trying [to] help rand find a way to avoid the [amyrlin] seat right now lol all the gates are barred and he can’t leave) (Ladies and gentleman... WE HAVE A BLADEMASTER!!! 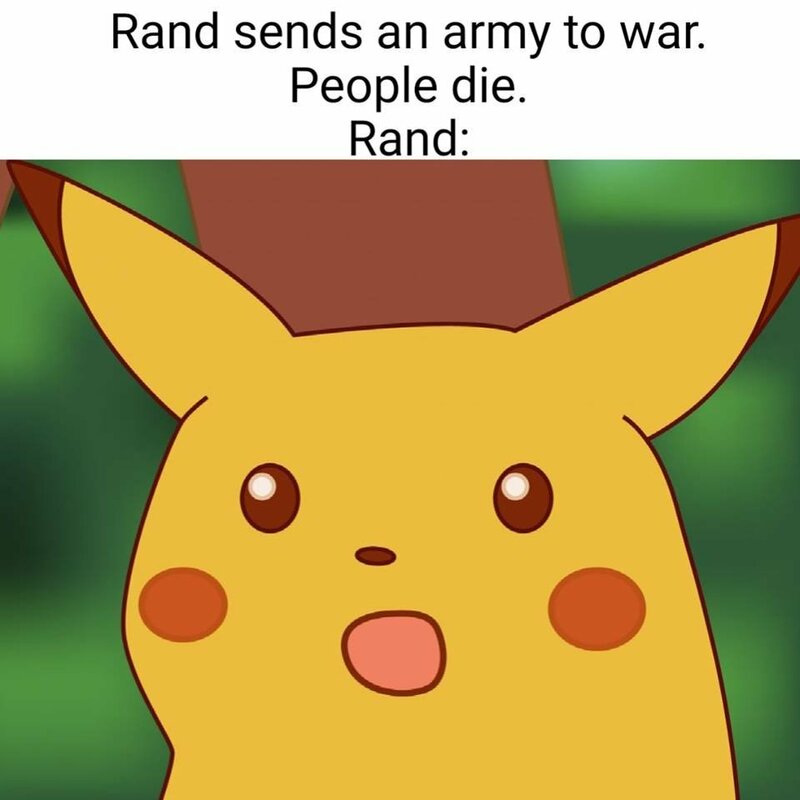 GO RAND GO) (MAN EGWENE IS GOING NUTS KILLING SEANCHAN PEOPLE WITH LIGHTNING!!!!) (LORD INGTAR NOOOOOOOOO WHYYY!!!!!!) 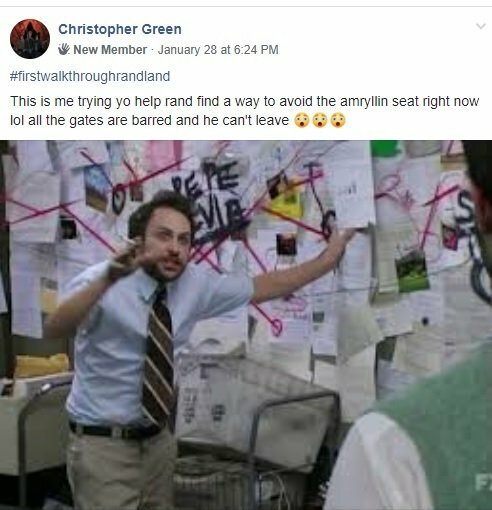 Christopher started using the hashtag #firstwalkthroughrandland on all his posts once his followers begged him to. And some have even expressed their anxiety that Christopher hadn’t posted yet that day. And naturally, everyone is waiting with anticipation for Christopher to reach certain scenes. (I can't wait till Christopher gets to the end of Fires of Heaven, and asks the biggest burning question of the series that we all fought and theorized over for years. Who ___ed ___an?) And this past weekend, he finally hit the turning point for Mat. Christopher didn’t care for Mat at first: (I woke up and was thinking.... that I have no idea how mat is important to the story other than comic relief and mischief? He literally got stabbed by a knife and that's it so [far]. I mean rand can channel and is the dragon, Perrin talks to wolf's and the women are aes sedai.) But the scene where Mat challenges Galad and Gawyn to a spar changed his mind. (WHAT THE HELL HE WON AND WHOOPED EM.... I LIKE NEW MAT) Almost everyone has been kind and considerate to Christopher, and they are going out of their way to avoid spoiling major parts later in the books. Christopher is happy that everyone is being nice and getting such joy out of his shared experience. You can read with Christopher on his journey at the Screw You All, I Love Wheel of Time Facebook group! And the points stand thus: art336: 1 JamesBrown: 5 Gentled Ben: 2 So, JamesBrown is our winner! I will get an award siggy made within the next few days! Thank you all for playing! Yes, you got it JamesBrown! I'd never seen these before either. I enjoyed it! But when I tired a 5x5 puzzle, I couldn't figure it out! You have till midnight (EST) to turn in your answers. PM me with your responses. They will be graded tomorrow and the winners will be announced! Day 5: 25. What is the name of the scandalous dance the Tinkers perform for Perrin? 26. What country were Perrin and Egwene pretending to be from? 27. How does Moiraine form a link to the three ta’veren? 28. How does Nynaeve find the Emond Fielders in Baerlon? 29. What’s the name of Moiraine’s horse? Bonus: 30. What name does Loial know Fal Dara as? Puzzle 6: Futoshiki also known as "More or Less" is a logic puzzle with simple rules and challenging solutions. The rules are simple. You have to fill the grid with numbers so that: - The numbers are from 1 to the size of the grid i.e. 1 to 5 for a 5x5 puzzle. - Each row and column must contain only one instance of each number. - The numbers should satisfy the comparison signs - less than or greater than. - For bigger puzzles the letters (A,B,C etc.) follow after the number 9. You got it, Ben! One point for you!